October 20, 2010 by Mr. Throughout history, there has been much discussion about what it means to be a man. There are many qualifiers, and they change overtime–not by a lot, but they do. Luckily, the world has guys like me to follow as examples. When KFC’s Double Down Sandwich was first introduced in the US, I knew right away this delicious meat on meat on more meat sandwich will one day end up in my tummy. Call it man-stinct or what have you, I just knew. While travelling through Washington, this day came. I started it like any other day, full of vigour and testosterone. However by the afternoon, I wasn’t feeling up to my usual self. So after I wrestled with a couple great whites, fought with a band of ninja pirates, and conquered a few local villages, I decided to call it a day and pickup a colonel’s Double Down for dinner. As it turns out, that was my manliest experience of the day. The Double Down is composed of bacon, two different types of melted cheese, the Colonel’s Secret Sauce (I know what it is but can only share with other real men), all sandwiched between two deep-fried chicken fillets. I do believe it’s also offered with grilled chicken for the weak and the lame. A bite of this mighty manwich can be compared to a tiny meat nuke going off in your mouth, or rather, a meat-plosion. It’s awesome! In addition to its deliciousness, the Double Down offers you a whole day’s worth of sodium intake in a neat little package, isn’t that convenient? The key to this enjoyment is don’t let it get cold, as it will tighten up and lose some of its awesomeness. I know some of you health nuts out there are crying foul. Since I’m feeling nice today, I won’t cover your mouth with my fist, instead, I will remind you that you only get to live once, might as well live a little and enjoy the little things, like stuffing your arteries. This has been a short-take from a manly man, peace out. Editor’s note: For one month only, Canadians will get to try the Double Down without the hassle of crossing the border. It’s offered until Nov 14, 2010. Read the original press release here – it says the sandwich has 540 calories, 30g of fat and a whopping 1,740mg of sodium. Consider yourself warned! Tempted to go try the double down myself..
Kevin, you should rally up more people to leave comments on Mr.’s posts so he would write more often 😛 He loves compliments!! on October 27, 2010 at 11:23 am | Reply Mr. Thank you very much, just when I thought my ego couldn’t get any bigger. 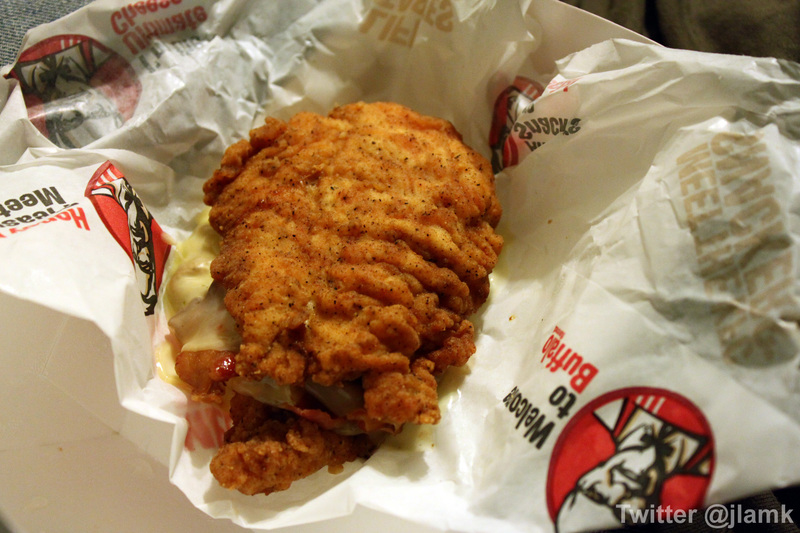 Grrrr…they discontinued the Double Down in Canada…I didn’t even get to try it yet…LOL!!! I didn’t know what ‘ego’ was till now. This is heart-warming. Another win for men it seems.